In honour of Lola’s mother’s birthday, we ventured to the Savoy Brasserie in the heart of beautiful Westboro. 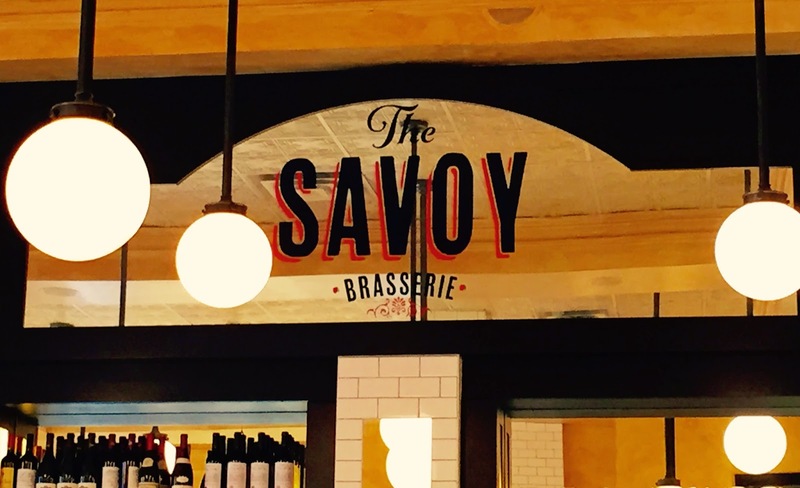 Much like its sister restaurant – the Metropolitain Brasserie – the Savoy features classic French dishes, fresh seafood, as well as a raw bar. 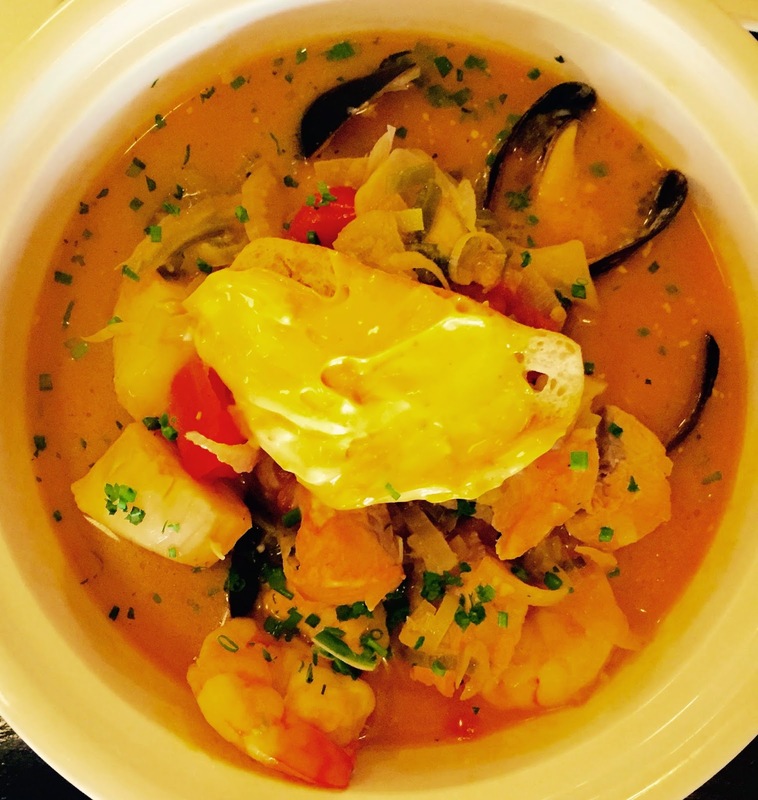 The vibe and décor is on par with a typical French bistro, which brings a sophisticated French twist to a traditional pub. High pressed-metal ceilings, huge windows and creamy yellow walls are enhanced by an intricate tiled floor, mirrors and globe pendant lights. Seating varies between high and low banquettes and booths, including plenty of room at the large zinc bar. 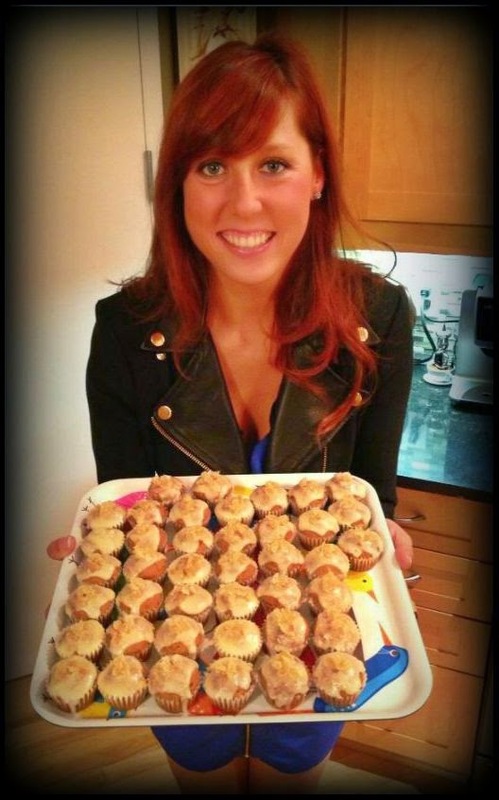 The restaurant is very bright and inviting and we immediately felt comfortable and welcomed. Unfortunately the service was on the slow side, but our waiter was friendly and competent, and I suppose this only added to the French charm. We were lucky enough to drop by on a Sunday, which is known as ‘Champagne Sunday’ due to its specials on champagne and sparkling wine. We obviously had to take advantage of this and we ordered the Prosecco Di Conegliano for half off! This was certainly a good start! Our other dining companions ordered an assortment of wine from their comprehensive wine list, which features a nice blend of old and new wines, available by the glass, half-carafe or bottle. To start, we were served complimentary bread and butter (something I believe that all restaurants should do). 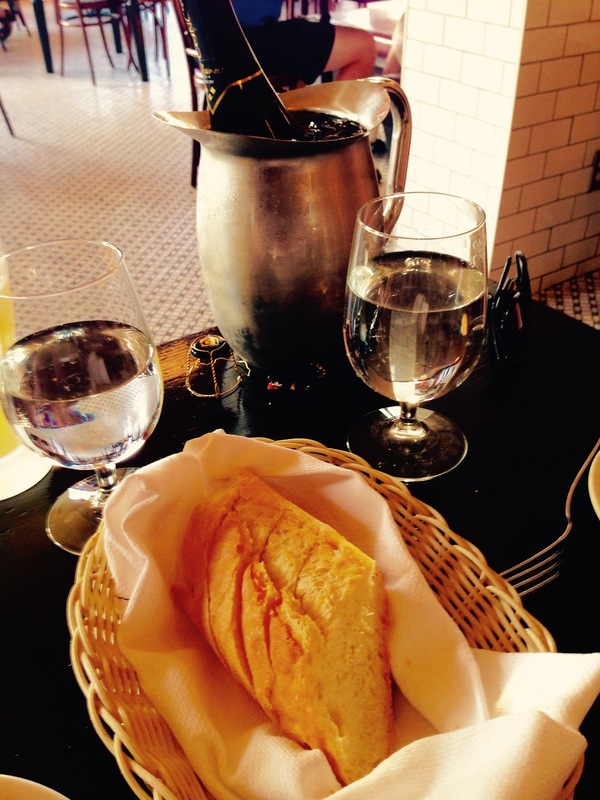 The bread was served cold with plain butter, just as it would be in a traditional French bistro. We took advantage of several ‘top ups’ as we enjoyed our various dishes. Next, we all chose to share an assortment of hors d’oeuvres. As per usual, their extensive menu made choosing very difficult. But in the end, we chose the Fried Calamari with lemon dill yogurt sauce ($13), the Raclette with smoked duck breast, cornichon, and cocktails onions ($14), the Fondant de Camembert baked in puff pastry with caramelized onions and cranberry walnut preserve ($14), and a dozen oysters ($12). All of the hors d’oeuvres were tasty and enjoyable (and honestly speaking, we probably could have stopped there…especially after all of that bread!) The only real complaint was that the Raclette was served on a plate already melted, instead of on a typical raclette grill. Following the apps, we were then presented with our elaborately prepared main dishes. 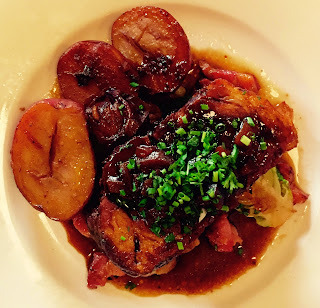 Between all of us, we tried a wide range of their entrées, including Beef Bourguignon ($25), Cast Iron Seared Steak au Poivre ($30), Braised Wild Boar ($25), Baked Seafood St. Jacques ($27), Nicoise Salad ($20), and Bouillabaisse ($25). 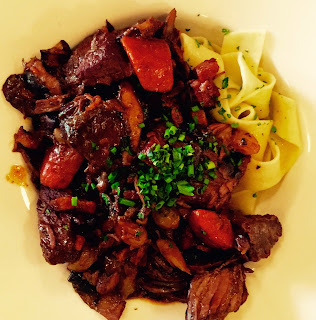 The Beef Bourguignon, paired with mushrooms, pearl onions and red wine demi-glace, was served over buttered pappardelle. The dish had a fine depth of flavour, and certainly lived up to the meltingly tender ideal. 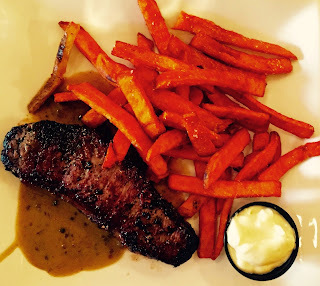 The Cast Iron Seared Steak au Poivre was drizzled with a green peppercorn cream sauce and served with sweet potato planks. The huge portion of steak was cooked perfectly, as well as the fries, which had crisp exteriors and fluffy interiors and were salted and paired with a rich garlicky aioli. The Braised Wild Boar was marinated in a maple brandy sauce and served with fondant potatoes and brussel sprouts with bacon. The boar was succulent, flavourful and very tender. No complaints, except that it was very filling! 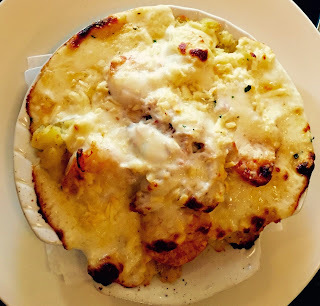 The Baked Seafood St. Jacques was an indulgent, rich meal of creamy mashed potatoes with scallops, shrimp, mussels and crab, topped with Mornay sauce and Gruyere. The dish was very rich and delicious, but it could have used some vegetables. 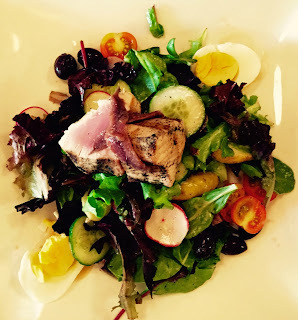 The Nicoise Salad was served with albacore tuna, kalamata olives, boiled egg, green beans, radish, fingerling potatoes, tomato and anchovies. While it was a nice light choice, it certainly did not stand out in comparison to the other hearty dishes. Finally, the Bouillabaisse, which was my entrée, was a plentiful serving of seafood, including mussels, shrimp, scallops and fish, in a tomato saffron fennel broth, topped with a rouille-topped crostini. The broth was very appealing and I enjoyed the dish immensely! Overall, we were quite pleased with our food, and the entire culinary experience! 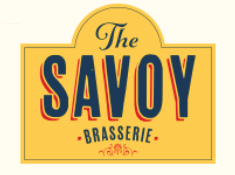 While we enjoyed Sunday night dinner, the Savoy is also known for its breakfast, brunch and lunch menus. In addition, Friday nights are famous for oyster shucking and live music! Hours: Sunday 9 a.m. to midnight; Monday to Friday 8 a.m. to 1 a.m.; Saturday 9 a.m. to 1 a.m.